Together alongside long time friend A.Dee we both traveled to Bristol to see Chris Malbon the Artist behind the King of the Beats Logo, branding and Poster. To help fund the project we released a limited run of the poster that he created. As a special gesture Chris is hand signing all of them. Of course me being me, not to waste any opportunity. I shot a short piece with the man, going into his history and background, and how he came up with the idea and concept for the movie poster. Both of us have come a long way from our days in the School Playground drawing Spiderman and the Hulk to see who was the better artist. It was great that A.dee was able to join us, as he was the man who pushed me into becoming a film maker. In the early days the three of us used to talk about creating art and working together on some visual projects. Alongside Chris and Eric Orr, A.Dee agreed to create a poster and some art towards the project. Money raised from the sales of the poster are to go back into the project. To return back to NYC to complete shooting. I would like to thank all those that have already supported the project and purchased their poster, they will be with you shortly. Here is a exclusive preview of the trailer for the upcoming film by Pritt Kalsi, Jazzy Jay and JFK Aman. Currently still in post production. Im very excited about this film as anyone can imagine, but anyone who knows me and my work will know that this is a make or break moment. In August 2012 Jazzy Jay spent a month here with me in the UK. I was not in the best of state that time. Thanks to him and others who know who they are, he helped guiding me into recovery. I started to see that I had to make some serious changes in my life. After speaking with my family Jazzy openly invited me to NYC to work on this project. Leaving me to my own devices he assured me what ever I need to do he will help me achieve it. Along side him and DJ Supreme from group Hijack I presented my idea and got the green light off them both. I approached my friends in NYC, the true masters, pioneers and producers of classic material and asked if they would take on the king of the beats challenge. 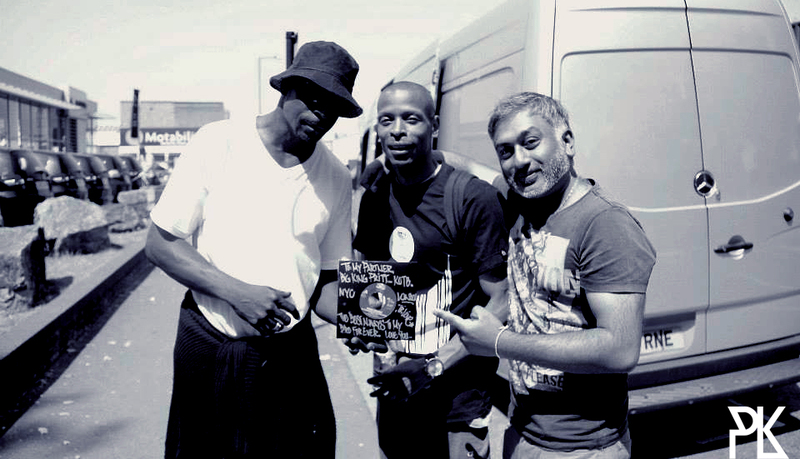 Filmed in Mecca New York birth place of Hip Hop. I would like to thank Steven Ellington and Andy Higgs for believing in me, taking time out their schedule, spending their own money to travel to New York to help me make this, I believe it was worth it. I didn’t know anything about sites like Kickstarter, this film was made able by the people who supported my art, buying prints, supporting my campaign that I went on early this year. I would like to thank Aidan Butler my childhood friend who I bumped into in NYC after leaving the Marley Marl show, who helped us out when we had problems with one of our cameras, who offered support to the project and donated some film. Jazzy Jays Wife who allowed me and the team into their home. Marley Marl, Diamond D and Lord Finesse who have always given me time in NYC and UK allowing me the freedom to shoot them when ever. Zion for putting us up!. Phat Gary for his support and guidance, Biggest Gordon my old time friend who I was trying to find and bumped into in the street. A.GEE for the serious talk. Unlike most films out there, this is a film made by someone still working in a factory who has passion and drive for telling a story about the culture he loves unmatched to others. Almost 20 years and still grinding. After making the trailer I could see the potential and power within this film. We spent 3 weeks in NYC shooting and didn’t get to shoot everyone we wanted due to schedules and even some people being carted off by the law. Hence releasing the artwork by Chris Malbon yesterday. If you watch this and believe in this project. Please support the campaign and purchase a print. Look out for Art coming from legendary graff artist Eric Orr who also features in the film. To all those that took part and supported the project, those that believed in me I would like to thank you. Real recognize the real. Thanks to Chieko who flew over from Japan to watch me make the trailer. 5th Element who earlier today premiered the trailer in Japan. Another great video from the FUSE team. Lord Finesse. One of the greatest to ever do it. Over 10 years ago i went to his place to shoot a video. He is one of the most humble artists i know. He’s supported my work from the get go. Recently we met up again in the UK for his promotional tour for his up coming Album. Alongside DJ Boogie Blind, it was one of those shows that if you wasn’t there you missed something special. He knows his place in the scene, he knows who is audience is. and he delivers nothing but in my opinion the tightest and most seamless show from any artist out there right now. If you do get a chance to see him perform make sure you do not miss it. Exclusive Poster Artwork. Limited Edition – You Gonna Get Yours ? Designed and created by long time collaborator and friend Chris Malbon, here is a first exclusive look at the movie poster created by one of ‘Creative Magazines’ top 10 global creatives. This is the first run of the poster and limited to 100 prints only. Signed by the Artist Chris Malbon and Film Director Pritt Kalsi. A2 printed on 120GSM Bond. Money raised will go into finishing up the film and shooting missing scenes. I remember the many phones calls me and Chris had discussing the new look KING OF THE BEATS, It was after I returned from NYC and spoke to Chris detailing my experience out there, he was inspired and came up with this design. 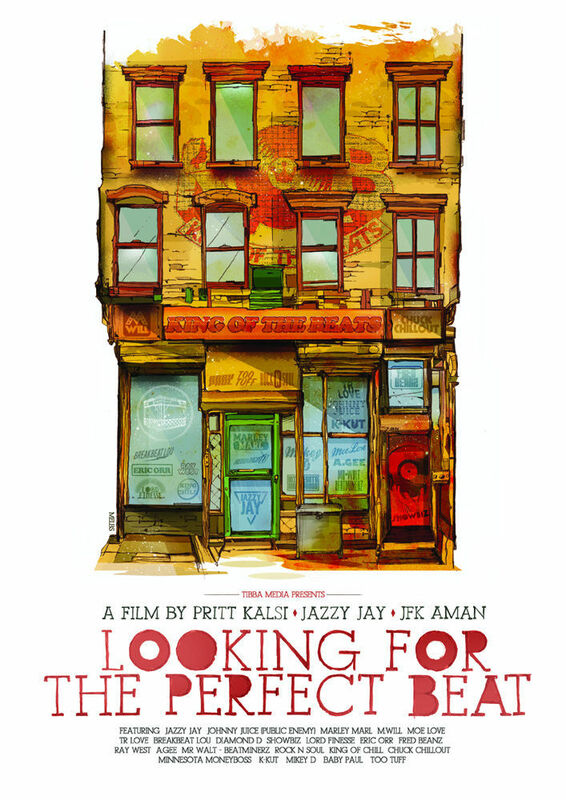 Inspired by Bed stuy, Brooklyn home base for me and the film crew, Andy Higgs and Steven Ellington. He looked at the pictures we brought back of shop fronts, signs, streets and buildings, his aim was to capture the spirit of Hip Hop Culture and our time in the states. We spent one day together having a meeting , brainstorming and planning where we wanted to go with this design. Not following suit, artistically we wanted to present something new and fresh, injecting a little creativity and spirit into this culture we love so much. Just as Neville Brody made waves with his work for Depeche Mode and others, this is what we are trying to achieve and translate here into Hip Hop. Chris showed me some sketches he had made of buildings, alongside some of the current projects he was working on. Left to his own devices Chris returned to Bristol producing this fine piece of art. Tomorrow August 9th, is the day of the premier of our film trailer for the movie. To coincide with the launch day we are releasing this poster. If you are lover and supported of the culture and art and film making, please feel free to support the team, and purchase a poster. Shipping day August 30th. Ultramagnetic M.C’s – Critical Beatdown 25 Years Anniversary London show. Here is something very special for those who support my work and the band the ‘Ultramagnetic M.C’s’. One of the greatest Underground Hip Hop acts of all time. Embarked on a European tour to mark 25 years since the release of their critically acclaimed album ‘Critical Beatdown’. I have a long history with this group. In fact the first time I tried to interview them was when they first came to Birmingham City on tour. In the late 90s when I started working on my Film ‘The Men & Their Music’. I was introduced to Moe Love by the P-Brothers. For a couple of years me and Moe spent many hours on the phone, playing each other breaks, beats, talking about music and other stuff. In 2002 I made a trip to the USA, to start filming the project. A little nervous as my memories of him was that he looked like the meanest person in hip hop. In fact he’s one of the coolest. As a surprise he took me to meet Ced Gee in Harlem and we shot a film. My memories of that meeting Ced wasn’t really into the current state of Hip Hop music, he was involved in other things. Pursuing his love for Basket Ball. The shoot was very positive. Ced left with fire in his belly, and I left with amazing footage which lead me to make the film on Paul C.
Returning to the UK I was introduced to Marc Davis from Chicago, who is die hard Ultras fan, so much so he made it his mission to reform the group. Throughout that whole period I was here in the UK, being played the beats and tracks as they were being made. Later Marc, TR and Moe he dropped the ‘Ultra Foundation’ Album. It was outstanding LP, possibly the worst hip hop cover of all time but the music was second to none. Most of that should of been the ‘Best kept Secret’ LP. I returned to the U.S and shot 2 of the videos for that Album plus a short film introducing TR Loves protege Fred Beanz. Later I went onto produce their last single with new M.C, Fred Beanz. The ironic thing is I will never forget going to Ourprice records in 1988 with Jason Coombes as he brought the cassette never thinking I would later work with the group. Its not been a easy road for the group as you can imagine. So ofcourse when they contacted me to let me know the tour was on, I had to make sure I got to do something with the group to capture this moment. Although not a member of the band, I feel a part of their legacy. Sadly i could not join them for the whole tour due to my work commitments. I put this together for the group and the fans. Imagine what I could of done being on the tour. That would of been one hell of a film. In the mean time enjoy this. Look out for the future DJ MOE LOVE ‘DIGGIN IN THE TAPES LP’. For that project I revamped the original ULTRA Logo. This was a important and landmark moment for us all. Filmed by Pritt Kalsi and his team, Andy Higgs and Jay King. We are available to film / edit shows and events. For further info on costs please feel free to contact us. Ultramagnetic M.C’s For serious booking info, contact : live nation.